30 years, 4 months, 13 days old age. Dhawal Kulkarni will turn 31 on 10 December, 2019. Only 7 months, 16 days, 19 hours, 47 minutes has left for his next birthday. Dhawal Kulkarni has celebrated the total number of 30 birthdays till date. See the analysis by days count and bar graph. Dhawal Kulkarni was born on 10-12-1988 in Chunabhatti, Mumbai in the state of Maharashtra, India. He is an Indian Cricket Player. Dhawal Kulkarni completed his studies at Bandra IES New English School till 8th. After that, he attended Dadar, IES VN Sule Guruji. He brought into the focus after he played U-17 team in the Vijay Merchant Trophy. He maintained his excellent form for the U-19 state games and despite that, his name was incorporated into the 2007 U-19 Sri Lanka tour. His extreme accomplishments in Sri Lanka made his place in the team of Mumbai Ranji team. He was one of the main faces to make Mumbai the Ranji Champion 40th Ranji Trophy in the Ranji Trophy 2012-13. In his first Ranji season, he took 42 wickets and was also called the most successful bowler of the tournament. Although he gained tremendous acclaim in the domestic cricket, he was further to earn a space in international cricket too. In 2009, he was also selected on the overseas field of New Zealand tour. However, they failed in making the place in the playing XI in all the Test matches played. So far, he did not officially debut in Test cricket. After the success of the Quadrangular Series in 2014, he was appointed in the ODI Squad for England tour. He made his debut in the ODI international against England on Sept 2014. He also debuted in the T20 match on 20 June 2016 against Zimbabwe in Harare. His career-best bowling he exhibited against Sri Lanka in the third ODI match by taking the 4 wickets at 34 runs. For the consecutive six years, he played for the Mumbai Indian in IPL.In 2014, he played for Rajasthan Royals. The Gujarat Lions bought him in 2016. He was born to Sunil Kulkarni and Pramila Kulkarni. He has a sister named Dhanashree Kulkarni. He is married to Shraddha Kahrpude since 2016. In his first Ranji season, he took 42 wickets and was also called the most successful bowler of the tournament. He made his debut in the ODI international against England on Sept 2014. His career-best bowling 4/34 against Sri Lanka in 2014. 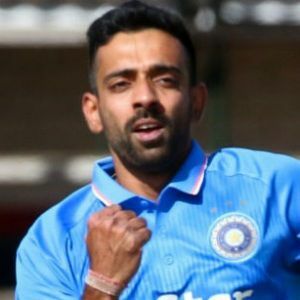 In the 2017–18 Ranji Trophy, he became the leading wicket-taker for Mumbai.